ST. LOUIS, Mo. – Throughout the month of December, 106.5 The Arch has collected over 21,000 cards for the pediatric patients at both of the St. Louis area Children’s Miracle Network hospitals – SSM Health Cardinal Glennon Children’s Hospital and St. Louis Children’s Hospital. Multiple schools and organizations, including the Ballwin Police Department, helped in creating and collecting holiday greeting cards in hopes to cheer up the pediatric patients and their families during the holiday season. 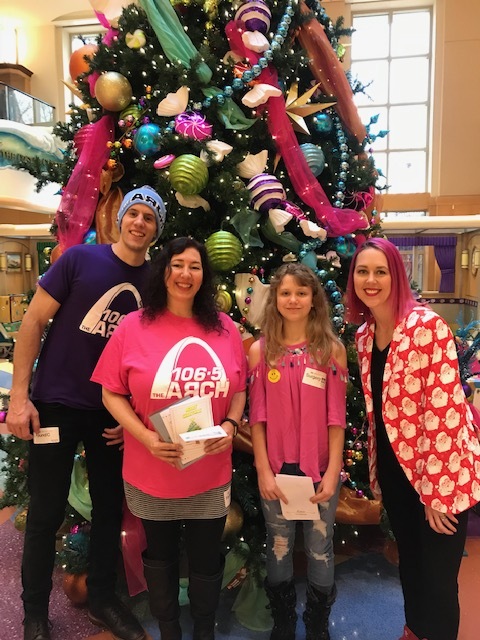 On Thursday, 106.5 The Arch’s on-air hosts Cassiday, Stacey and Jonah visited with the children and their families while delivering the holiday cards to both hospitals. FEATURED IMAGE/106.5 The Arch – Jonah, Stacey and Cassiday pose with a patient/HUBBARD BROADCASTING, INC.